Welcome, the Dodge Dakota R/T Enthusiast Connection is a online world-wide, community dedicated to the preservation, restoration, and enjoyment of Dodge Dakota R/T trucks. The connection was built to promote member sites of the Mopar Enthusiast Ring specializing in Dodge Dakota RT truck topics. Cruising the connection is a great way to locate Dodge Dakota R/T related information, web sites and owners on the internet. We are a proud group of automobile enthusiasts with a common interest of preserving and enjoying our Dodge Dakota R/T trucks. 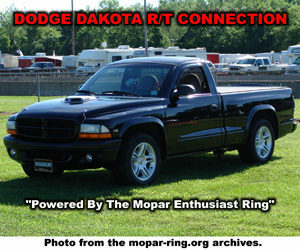 The Dodge Dakota R/T Connection Member list is 100% comprised from member sites and pages of the Mopar Enthusiast Ring. Hand picked by the Ringleader, only member sites with pages or resources devoted to Dodge Dakota R/T truck topics are considered. The Connection also features a great link section to other non member Dodge Dakota R/T resources. Have a Dodge Dakota R/T web site or page and want to get listed? The Connection is a great resource for promoting your site or page To be considered for the list you have to be a member of the Mopar Enthusiast Ring in good standing. Joining is totally free and is a great way to get more people to visit your Dodge Dakota R/T site or page. For more information on joining visit here. The R/T which stands for “Road and Track” is a limited edition factory produced “street truck” fashioned off of the Dakota pickup. Featuring a 250 horsepower 5.9-liter Magnum V-8 engine, 17-inch wheels, lowered suspension, performance tuned exhaust and other performance enhancements. The Dakota R/T was offered in two-wheel drive configuration only. Dodge’s R/T performance history started back to the late 1960s. The first R/T was a Hi-performance version of the 1967 Dodge Coronet. The standard engine was 440 cubic inch V-8 powerplant, heavy-duty suspension, beefier brakes, larger tires, and R/T badging. For Mopar gear heads the legendary 426-cubic inch Hemi engine rated at 425 horsepower was an option. Over the year’s Dodge offered many different models with an R/T edition including, Aspen R/T, Coronet R/T, Charger R/T, Challenger R/T, Neon R/T, Viper R/T10 and more. In 1998 Dodge added the first truck to the list, the Dodge Dakota R/T. The Dodge Dakota R/T Truck Connection is part of the internets oldest and largest Mopar Enthusiast Ring, featuring over hundreds of Chrysler, Dodge, Dodge & Ram Truck, Plymouth and Mopar sites and pages. Including a collection of Mopar related Clubs and Parts & Services sites. The mopar-ring.org server also hosts some other cool Mopar related resources. Including a Classifieds section, Photo Gallery, Screensaver section and a news section.